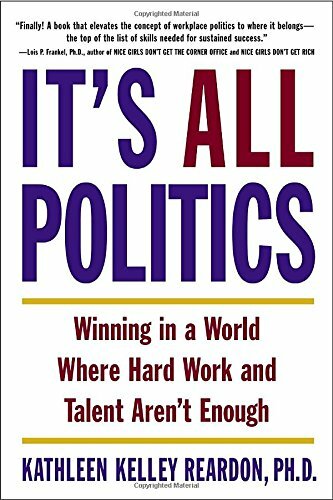 As management professor and consultant Kathleen Reardon explains in her new book, It's All Politics, talent and hard work alone will not get you to the top. What separates the winners from the losers in corporate life is politics. • Do I get credit for my ideas? • Do I know how to deal with a difficult colleague? • Do I get the plum assignments? • Do I have a mentor? • Do I say no gracefully and pick my battles wisely? • Am I in the loop? Reardon has interviewed hundreds of employees, from successful veterans to aspiring hopefuls, examining why some people who work hard and effectively at their jobs fall behind, while those who are adept at “reading the office tea leaves” forge ahead. Being politically savvy doesn’t mean being unethical or devious. At heart, it’s about listening to and relating to others, and making choices that advance everyone’s goals. Like it or not, when it comes to work, it’s all politics. And politics is all about knowing what to say, when to say it, and who to say it to.